You are at:Home»iPhone»Wireless»What Does “Disconnecting Nearby Wi-Fi Until Tomorrow” Mean? The Truth! You just saw a pop-up on your iPhone that says “Disconnecting Nearby Wi-Fi Until Tomorrow” and you don’t know what it means. This new message started popping up after Apple released iOS 11.2. In this article, I’ll explain why your iPhone has disconnected from nearby Wi-Fi networks until tomorrow and show you what you can do to reconnect to Wi-Fi. Why Is My iPhone Disconnecting Nearby Wi-Fi Until Tomorrow? Your iPhone is disconnecting nearby Wi-Fi until tomorrow because you tapped the Wi-Fi button in Control Center. 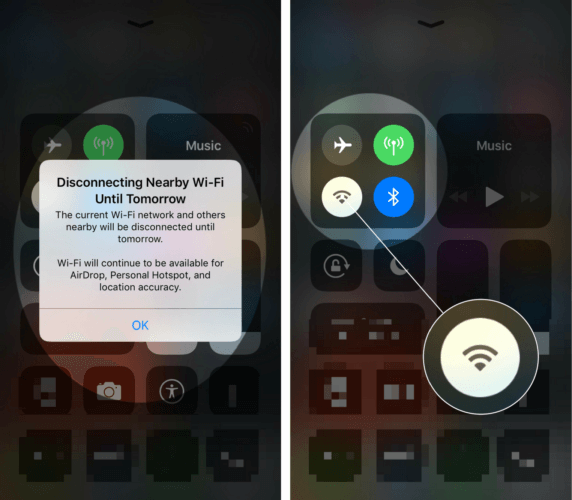 The main purpose of this pop-up is to clarify that tapping the Wi-Fi button in Control Center doesn’t completely turn off Wi-Fi — it only disconnects you from nearby networks. 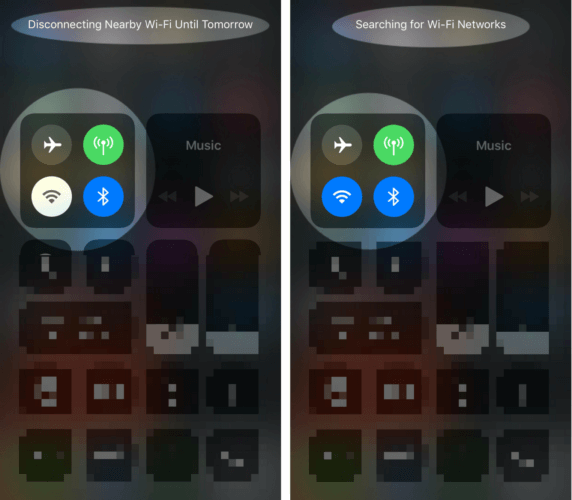 After tapping the Wi-Fi icon in Control Center, the “Disconnecting Nearby Wi-Fi Until Tomorrow” pop-up will appear on the screen and the Wi-Fi button will turn white and gray. The “Disconnecting Nearby Wi-Fi Until Tomorrow” pop-up only appears after the first time you tap on the Wi-Fi button in Control Center. Afterwards, you’ll only see a small prompt at the top of Control Center when you tap on the Wi-Fi button. Tap the Wi-Fi button in Control Center again. You’ll know your iPhone is connecting to nearby Wi-Fi networks again when the button is blue. Restart your iPhone. After turning your iPhone off and back on, it will start connecting to nearby Wi-Fi networks again. Go to Settings -> Wi-Fi on your iPhone and tap on the Wi-Fi network you want to connect to. What Are The Benefits Of Disconnecting From Nearby Wi-Fi? By disconnecting from nearby Wi-Fi networks while leaving Wi-Fi on, you can still use AirDrop, Personal Hotspot, and have access to some location-based features. This feature is also useful if the Wi-Fi network at work or your favorite restaurant isn’t that reliable. You can disconnect from nearby Wi-Fi networks while you’re out, then reconnect when you get back home. By not searching or trying to connect to poor Wi-Fi networks all day, you may even save a little iPhone battery life! 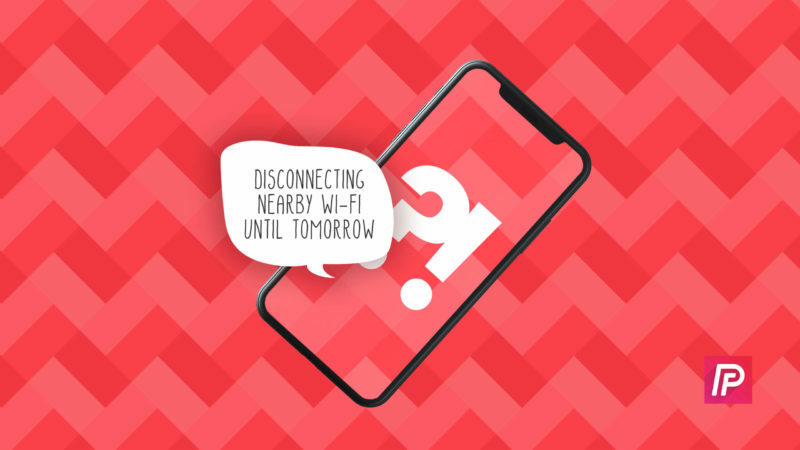 You now know exactly what the “Disconnecting Nearby Wi-Fi Until Tomorrow” alert on your iPhone means! I encourage you to share this article on social media to help your family and friends understand what this pop-up really means. If you have any other questions about your iPhone, leave them in the comments section below! Previous ArticleSpeakerphone Not Working On iPhone? Here’s The Real Fix! Next Article How Do I Turn Off Wrist Detection On Apple Watch? The Fix!